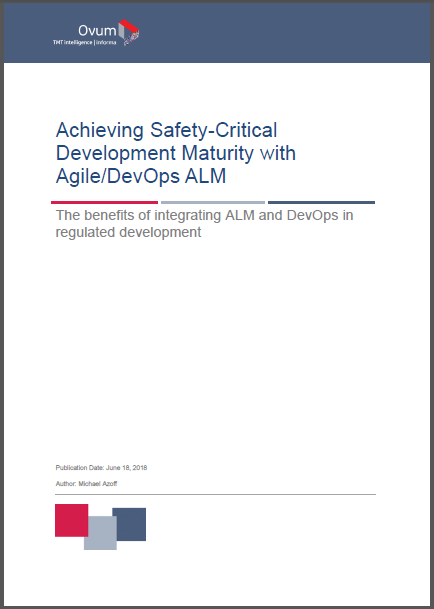 In this white paper released in June 2018, independent analyst firm Ovum investigates the benefits of integrating ALM and Agile/DevOps practices in the development of safety-critical products. Agile/DevOps are no longer considered differentiators, instead are now seen as the next phase of software development evolution. In an accelerating market environment, the need for faster time to market is forcing all industries to adopt agile and DevOps practices. Subtitled Benefits of integrating ALM and DevOps in regulated development, this paper analyzes the use of Application Lifecycle Management and Agile scaling frameworks such as LeSS and SAFe in regulated development. Through a case study with BMW, this Ovum report examines the means to manage risk at speed in the development of safety-critical systems. The paper also identifies the indispensable tools for showing the planning, traceability, and documentation in place necessary to comply with standards and regulations. Download this white paper to learn more about the role of next-generation ALM in safety-critical product development with Agile/DevOps practices.